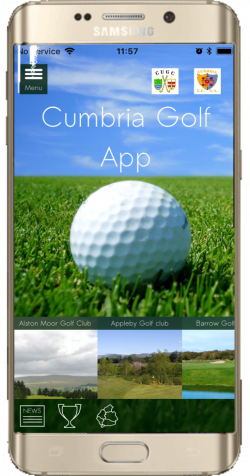 The Cumbria Golf Mobile App is available to download on Android and iOS devices. County Clubs in Cumbria - Find details for all 31 county golf clubs. In this section there is a list of all the County Clubs in Cumbria. To the right hand side of each club it will show whether the club has facilities for buggy hire or dining or both. You can also find clubs that have these facilities by clicking on the icon at the top of the list. I.e clicking on the buggy icon will show only the clubs that have this facility. By clicking on an individual club you can view details about that club. County Card Scheme - Find details about the clubs around England that are part of the County Card Scheme offering discounts for county card holders. My County Card/Handicap - A digital version of your County Card providing a CDH based handicap certificate acceptable worldwide! Scorecard - Keep your scores and see statistics for your performances around the clubs in Cumbria. Latest News - Keep up to date with all that is going on with the clubs in Cumbria. You can select an individual Golf Club or see all. Competitions - Keep up to date with all the competitions being held by the County and the Golf Clubs. you can select an indivudal Golf Club or see all. Once a competition is selected further details will be shown. Where to Stay - Find accommodation for when you need to stay away from home. There are also lots of features to be found on the App.